Published: Nov. 7, 2012 at 05:18 p.m. Updated: Nov. 7, 2012 at 07:08 p.m.
We'd like to present the following excerpt from the New England Patriots' official transcript of Tom Brady's Wednesday news conference. As background, Tom Brady was photographed earlier this week looking like only Tom Brady can. Q: We saw that you were at the Aerosmith concert the other day. TB: I was at the opening. I didn't stay for the concert. Q: Sometimes you dress kind of weird. Q: What's going on there? Who does that? Do you lay that out? TB: I have no response to that (laughs). I didn't need to do any research to know who was asking the question. Tom Curran of Comcast SportsNet New England is a former colleague of mine and a good friend. He loves busting chops -- no matter who it is. No one else in the Patriots' media corps has the stones or the sense of humor to somehow pull this off. The transcript doesn't quite do the video justice. We love that Curran didn't let the issue die, which in turn made Brady turn red with embarrassment. Brady personally thanked Curran on his way out of the session. "Trying to keep it light," Curran replied. "You're very buttoned-down today. I'm trying to keep it light." 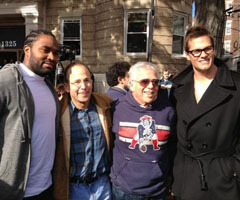 Curran also presented an inarguable fact: Brady indeed does dress kind of weird. We'll continue the hard-hitting analysis all week leading up to Bills-Patriots.